This version is as comforting as ever. To reduce the FODMAPs in the sauce, we used garlic infused oil and scallion greens instead of the usual garlic and onions. We also used low-FODMAP macaroni instead of regular macaroni—see the cooking and serving tips below for purchasing advice on that. In a large, heavy saucepan or stockpot, sauté the ground beef for 8 to 10 minutes over medium heat, breaking it up into small pieces with a spatula, until browned. Drain excess fat if necessary. Add the oil, scallion greens, and pepper; sauté until vegetables are tender, about 10 minutes. Add the tomatoes, tomato paste, Worcestershire sauce, salt, basil, oregano, red pepper flakes, and sugar. Cover the pot and bring the sauce to a boil over medium-high heat; reduce heat and simmer for approximately 30 minutes. Cook and drain the macaroni according to the manufacturer's suggestions. Immediately before serving, stir the sauce and the cooked macaroni together. Divide into serving bowls and top with grated Parmesan cheese, if desired. Ground turkey can be used instead of ground beef for a lower-fat version of this recipe. 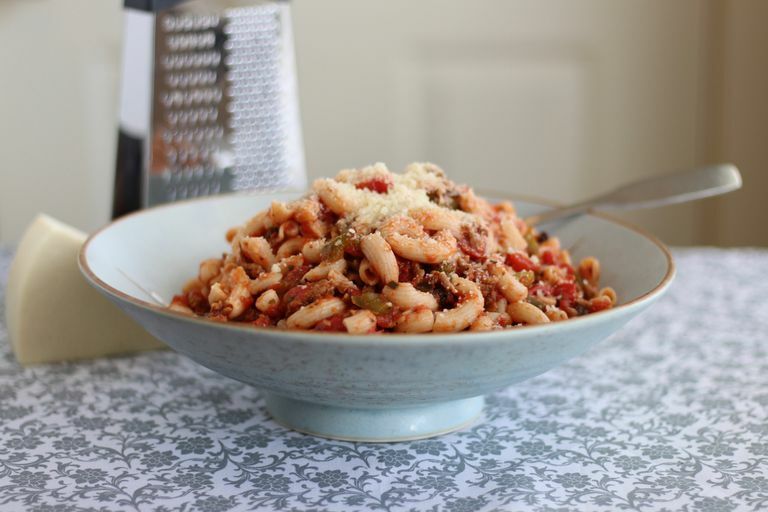 Although a low-FODMAP diet needn't be gluten-free, gluten-free pastas are usually low in FODMAPs because they are made without wheat. Our favorite low-FODMAP pastas are blends of corn and quinoa, or rice, corn, and quinoa. Read the ingredients closely to make sure that potentially high FODMAP ingredients such as peas or beans have not been added. The meat sauce can be made ahead of time, and reheated just before adding the cooked macaroni. The flavor profile of the sauce benefits from using fire-roasted organic canned tomato products if you can find them. This versatile sauce can be used with or without meat in a variety of ways, in any recipe that would normally call for jarred spaghetti sauce.